Unless you’ve been hiding under a rock the past few hours you’ll be fully aware that Sweden shocked world football after holding onto their 1-0 first leg lead against the Italians and securing a 0-0 draw in Italy, resulting in one of the biggest shocks in international football from recent times, with the Azzurri failing to qualify for the World Cup in Russia and the valiant Swedes progressing instead. 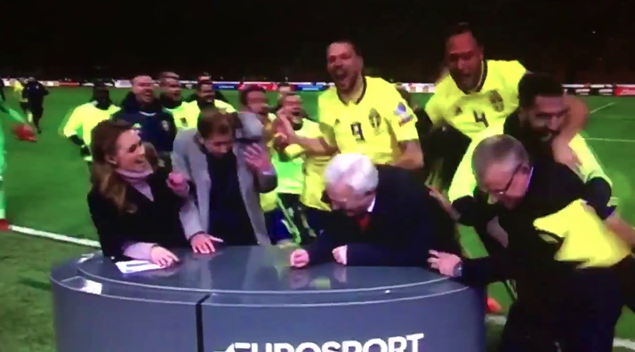 Understandably in a buoyant mood, the whole Sweden team decided to rush Eurosport’s pitch-side studio at full-time and get the presenter and pundits to join in on their celebrations. What a great moment.